Billionaire businessman Mark Cuban has teased a 2020 presidential run for months, and apparently his home state of Texas is behind him. A Dec. 23 poll conducted by the left-leaning Public Policy Polling showed that, were Cuban to run as a Democrat in 2020, his odds of winning a prospective race in deep-red Texas were 47% – compared to 44% for President Donald Trump. 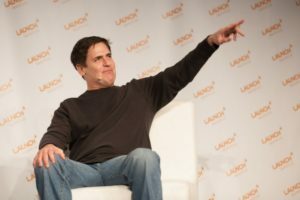 The data has many asking if a Mark Cuban presidency is more possible than we think. Fortunately, amidst Cuban's various hints that he may vie for Trump's job in 2020, he has also divulged bits and pieces about his actual policy ideas. So here's what we can expect from Mark Cuban in 2020 on healthcare, student loans, and taxes. Cuban posted his healthcare ideas on March 9 via his website, Blog Maverick, two days after members of the House GOP released their official proposal to replace the Affordable Care Act (ACA). In short: single-payer coverage for chronic physical and mental illnesses and life-threatening injuries, and standard insurance for all other healthcare. "There would be no mandates," he wrote. "There would be no individual penalties. No tax credits. No subsidies. No offsets or deductions for buying higher end insurance. This will be single-payer (yes I know it's a dirty phrase in this country) for chronic physical or mental illness and for any life threatening injury." "We would all end up paying more in taxes, but less in insurance and healthcare costs over time." Of course, Cuban is assuming that every American has health insurance. For those Americans that don't, this policy would force them to pay higher taxes for health services they didn't choose. Special Report: Cannabis Is the Gold Rush of the 21st Century – 30 Stocks to Invest in Now. Indeed, we can expect Cuban to expand even more on his "single-payer healthcare" plan in 2018. These are the sales agents who connect businesses with insurance companies for a significant cut of the premiums. If premiums decreased under Cuban's proposed health exchanges, these brokers would either take a huge pay cut or simply push premium prices back up to pad their pocket books. So far, Cuban has failed to clarify how or whether he would require insurance companies to keep premiums low. On March 28, Cuban took President Trump to task on student loan debt on Twitter. For Cuban, there is a lot to worry about given the $1.4 trillion in student loan debt the nation collectively owes. Student loan debt is only second to mortgage debt, and it has led many people to delay purchasing a home, getting married, starting a business, and even saving for retirement. In short, this debt is slowing down the entire U.S. economy. The problem is likely to get worse before it gets better. Trump's 2018 budget features cuts to programs like work-study funding, which helps low-income students pay for college. It also included plans to slash funding for the National Institutes of Health, a major funder of university research. Cuban's solution: force students to stop taking on debt. Cuban told CNBC back in 2014 that he would fix the student loan bubble by limiting the amount of loans each student can take annually to $10,000. He added that a cap on student debt would force universities to lower tuition and curb spending. He believes that rising tuition costs don't actually contribute to a better education. A college is just as likely to use the extra cash to "build a better fitness center at your school," Cuban told CNBC. A Cuban presidency would likely mean a cap on private lender loans in particular. On Blog Maverick back in March 2017, he wrote that those institutions are the real "sharks in the water." In the same post, he argued that the U.S. government should offer prospective students more federal loans – which would raise federal taxes for all of us. Add me to the Mark Cuban vote. I would vote for a successful businessman who supports entrepreneurs over a con artist with a narcissistic personality disorder anytime.